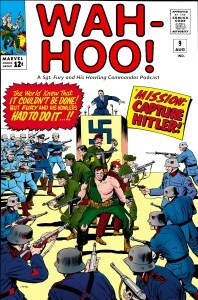 All right, troops, the holiday break is over and the podcast is back with a big-time change of scenery for our mild-mannered Howling Commandos. They’re off to the Pacific Ocean theater of war, to rescue a courageous intelligence colonel from a Japanese prison camp on Okinawa, with only hours until Allied bombers blow the island to Kingdom Come! Yep, it’s a new year for the Wah-Hoo! podcast, and a whole new ballgame for Sgt. Fury and the boys, so give us a listen! It’s the biggest, baddest mission yet for Sgt. Fury and his Commandos! Their mission: get into the heart of Nazi Germany, and grab der Führer himself, Adolf Hitler! Of course, it’s not quite as simple as all that, thanks to the return of Baron Strucker, an appointment with a Nazi firing squad, and some unforeseen… “complications” from the storytelling end of things. It’s a bit of a reading slog for Brian and Dion this week, but they’ve turned their “problems” into podcasting pleasure in a rip-roaring episode of Wah-Hoo! In this episode, we meet not one but two important new characters! It’s the first appearance of the villain who would go on to be one of Captain America and the Avengers’ toughest foes. 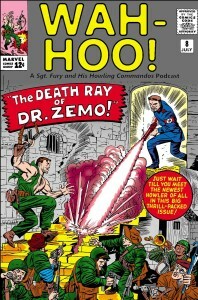 But before he led the Masters of Evil, Baron Zemo got his start as Dr. Zemo, a Nazi scientist who has invented a death ray that could win the war for the Third Reich! So the Howling Commandos are sent to stop Dr. Zemo, and they’ve got the newest Howler in tow—meet the very British Percy Pinkerton! Fury in the dock! The head Howler is on trial for his life after refusing a direct order and striking a superior officer. And the worst part is, Fury can’t remember why he did it! How will the Sarge get out of this one? Find out as Brian and Dion examine issue #7 of Sgt. 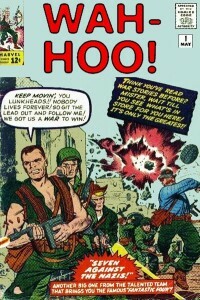 Fury and His Howling Commandos in this all-new episode of Wah-Hoo! This time around, the Howlers are going after an honest-to-goodness legend: the Desert Fox himself, Field Marshal Erwin Rommel and his Deutsches Afrika Korps. And not only that, but they’ve got themselves a new Howler in tow… but the new guy’s got a bit of an attitude problem that might wreck the whole mission. 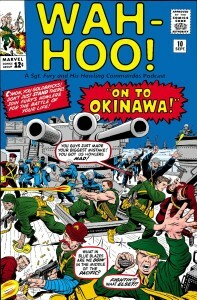 Yep, another week, another suicide mission for the Howling Commandos—and another episode of Wah-Hoo! giving you the in-depth story! Still reeling from the loss of one of their own last issue, the Howling Commandos might lose their (ridiculously) fearless leader when Sgt. 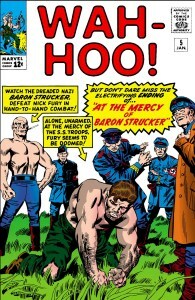 Fury is challenged to man-to-man combat by the infamous Nazi weapons master Baron Strucker… but the challenge might be a trap! (Ya think?) Brian and Dion return for more Nazi-punching, howitzer-stealing, comic-book-analyzing shenanigans, so come along for the ride. And while you’re at it, drop us an e-mail to let us know what you think at our (finally functional) address: furycast(at)podwits.com! Sgt. 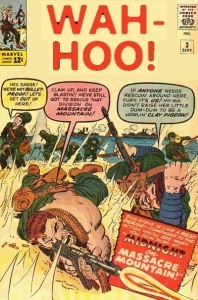 Fury #4 is based on the real-life story of Lord Haw-Haw (which Dion knew all about and Brian didn’t—laugh at Brian’s ignorance, laugh we tell you! ), but of course turned into a fightin’ action epic in the mighty Marvel style! 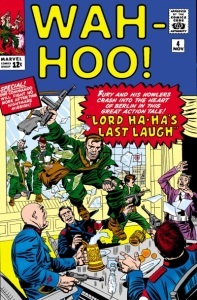 The Howling Commandos head for the heart of Nazi Germany, into Berlin itself, on a mission to extract the British traitor known as “Lord Ha-Ha,” but the traitor’s true identity makes this mission a little more personal for one Sgt. Nicholas Fury. Add in the momentous loss of a Howling Commando, and you’ve got another classic comic! Brian and Dion break the whole action-packed shebang down for you in this all-new episode of Wah-Hoo! You couldn’t possibly get more “World War II” than Sgt. 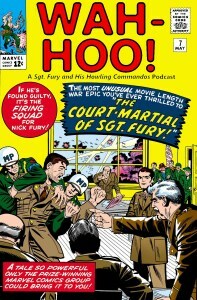 Fury‘s second issue! The Nazis are pursuing atomic weapons, and to stop them Sgt. 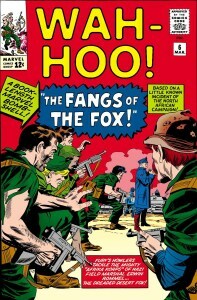 Fury and the Howling Commandos have to get themselves thrown into a concentration camp! Yup, another day, another suicide mission for the Howlers, and Brian and Dion have all the action and historical details covered, so grab this new episode on the double, soldier! The battles begin! Your hosts, Brian and Dion, introduce themselves and discuss the background of how Sgt. Fury and His Howling Commandos came to be in the first place, then dive right into the action-packed first issue. Get into this two-fisted World War II comic from the very beginning, and hear about the featured “Weapons of War” page and this story’s historical accuracy (or lack thereof). This is only the beginning, folks. Let us know how we’re doing with a comment below, or an e-mail to furycast(at)podwits.com.